Checkout our extensive range of products to keep your pool healthy! We offer a complete range of services to meet your needs. Get the peace of mind knowing our technicians are all experienced and fully certified. Looking for franchise opportunities with Poolwerx? We have an award-winning franchise system that has proven results. Download our information pack to learn more. Need to find your nearest Poolwerx? Use our finder to locate your closest store or mobile service provider. 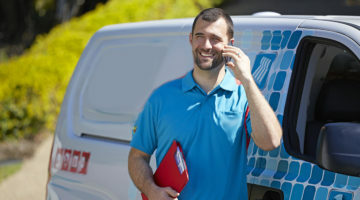 Mobile Pool Servicing – we can come to you! We want to be the company you depend on for high-quality pool servicing. You can rely on our team of pool technicians when you need a regular or one-off service, a pool inspection, an installation, and we can even take care of those tricky repair jobs. We have the tools and expertise to make your pool healthy. We stock a wide selection of pool and spa products to meet your needs, including regular pool maintenance products such as pool chemicals and pool maintenance accessories to maintain your pool between services from our technicians. We can also supply a wide range of pool pumps, pool filters, chlorinators, and heating equipment from world-leading brands, and we can take care of the installation for you. Our team have worked with these products for years and can provide advice on selecting the product that best suits your needs, provide you with a quote on cost and regularly maintain your equipment to prolong the life of the products. The Mt Fifi is 2 x 2 metres in size that fits into the most compact outdoor areas. There is no need to compromise on comfort and performance. Mt Fifi offers sublime hydrotherapy and comfort, including a full-length hydrotherapy recliner. The Mt Rundle is an entertainer’s dream. Due to its lounger free design, 7 adults can enjoy a wonderful hydrotherapy experience whilst socialising or relaxing. The Mt Louis has 6 full size seats, 55 jets and a full length recliner, make it the perfect family spa for those who are seeking an above average level of hydrotherapy. Varying seating heights also make it the perfect choice for younger families. Due to its generous size, the Mt Norquay is the ultimate in a large capacity hydrotherapy spa. Its 7 generous seats plus an 8th jockey seat make it an entertainer’s dream, whilst the two virtual recliners and 62 jets put it at the pinnacle of hydrotherapy capability. For growing families, the Mt Sawback provides no compromise. Through intelligent design, the Mt Sawback offers two recliners of varying lengths, whilst still maintaining 6 full-size seating positions. 60 jets driven by two powerful jet pumps ensure this spa is the ideal solution for post-exercise recovery or extreme relaxation. © 2019 Poolwerx Corporation Pty. Ltd.